I’ve been digging a swale across the back of my shed for about 6 months now. We first started it as a small diversion ditch to direct rainwater runoff away from the shed, as it would flow under the rear wall and wet everything on the dirt floor. Then we had the pigs in a pen above the ditch, and I really didn’t want to waste the nutrient that was flowing downhill every time it rained. 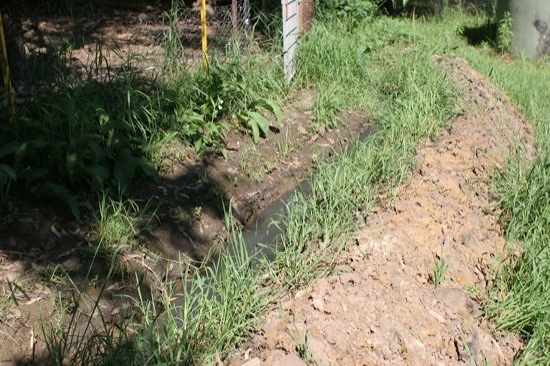 Over time, I dug the swale deeper and wider, and brought it back closer to level so it would hold water for longer and hydrate the soil around it. Of course, I finished digging it and took quite a while to do anything more. Sometimes life gets in the way! 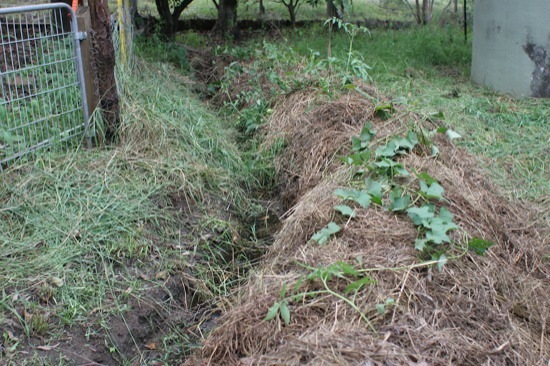 In the photo below, you can see how much the weeds had started to take over. You can also seed the comfrey I planted along the bottom edge of the pig pen, both to catch nutrients and as a feed supplement (and compost supplement when we don’t have pigs). I then had a brainwave and decided to dig a banana circle at the lower end of the swale, where the excess water flows out of it. It’s basically just a big round hole, with the swale feeding in water on one side and an overflow point on the other side. I dumped some chopped up palm trunks in the pit, which should absorb plenty of water and release it slowly to surrounding plants. 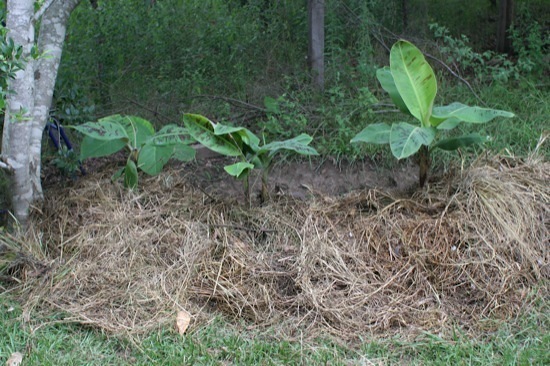 I’ll keep piling compostable materials (leaves, garden waste, etc) into the pit to keep up the nutrient supply to the bananas. I finally got the time last weekend to properly mulch the swale. I had let it go too long, and it was a huge job to pull out all the grass and cut down the weeds, but a nice thick mulch layer will hopefully stop them from growing back. In this photo you can see a mango tree and sweet potato vine. I’ve also planted a coffee tree, some loquats, taro, and banana plants. There’s space for a few more fruit trees, and I’d also like to plant some lemongrass into the swale to use as a future mulch. The mulch is made up of long grass from around the fences and a native grass plant (pennisetum alopecuroides, I think?) that I’ve been trimming back recently. I spread all the trimmings across the ground in the chicken run, and let the chickens scratch it over for a couple of weeks. Hopefully they picked out all the seeds so I won’t get weeds sprouting. It dried out like hay, and had a lot of chicken manure added to it. Then I raked it all up and spread it on the swale. After just a few days, the bananas are already looking a lot happier! It looks much neater, too. I’ve got six banana plants growing now and am looking forward to a harvest, hopefully towards the end of this year or early next year. I’m very envious of Ally and Rich’s huge bunch of bananas! Our bananas are a year old and nearly 3 metres high – they seem to like manure on their feet and the humidifying company of pawpaw trees 🙂 You mentioned in an earlier Pig-Post that there are Jamberoo farmers who sell beef direct – could you provide contact details please? I’d prefer to buy grass-fed beef direct from a farm. cheers. @Liesel: Wow, that’s huge! Pawpaws are another great idea for planting on the swale – thanks. I’ll email you some contacts for buying beef later. A few pointers about the bananas… You will find that the distance between your plants is far to close. They should be a couple of metres apart. As bananas grow and sucker, they increase in size below the ground. So in a couple of years, your plants will be growing on top of each other. This will reduce the health, yield, and vigour of your plants. On a related note, keep your bananas plants sucker habits with a small an area as possible. Many permaculture related recommendations have the bananas moving around the circle as they manage the mother, daughter, grand daughter relationships. This is a big mistake as eventually the bananas will be growing on top of each other. As well, the sucker management will get more intensive. In the bottom of your banana pit, you should put some alkaline material such as wood ash, lime, or similar higher pH substances. The reason is that if water is trapped with lots of organic matter, it tends to become acidic. This is not an idea environment for bananas so the lime etc will help prevent any acidic environments. Palms fronds and wood shavings are also great alkaline material. Another tip is keep your sweet potato away from the bananas. They generally prefer acidic environments and will compete with the bananas. Their tuber production around the root base of the bananas can be a problem (e.g. how do you harvest them without damaging the banana’s root system). Also, I would not waste the swale space with a loquat. These plants are very tough and seem to produce better under harder conditions. They are also great wind breaks. So if you have a section with poorer soil that could provide a wind break to other plants, then a loquat is one of the top fruit tree choices. If you haven’t got a Blue Java banana planted, then you really should try to acquire one. They are top desert/smoothie banana (not really an eating plain banana as they taste best when smooshy). Dwarf Ducasse is another top choice for a very very tasty eating banana. 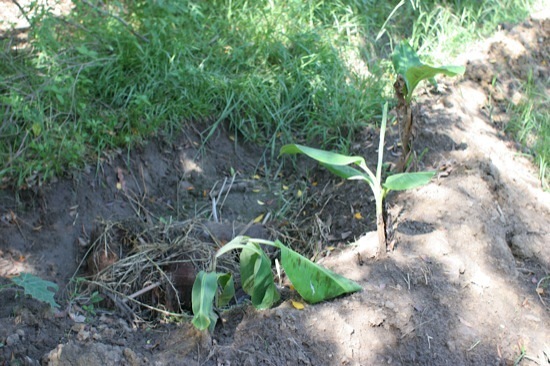 The bananas haven’t been in for very long, so it shouldn’t be a problem to transplant some further along the swale to thin them out. I need to read up on sucker management. Sounds like I should move the loquats, too. The sweet potato isn’t near the bananas at this stage, so I’ll keep it that way. We get wood ash from our fireplace through winter, so I’ll add that to the banana circle to keep the acidity down.